*Area, Population and Density rankings refer to Glastenbury’s relative position among Vermont’s 255 civic entities (9 cities, 242 towns, 4 gores and grants). Complete rankings are here. In its charter, it is spelled Glossenbury, after the English pronunciation; the English spelling, however, is Glastonbury. There being no member of the peerage associated with the town until later, the most probable reason for Wentworth’s use of the name was to recall Glastonbury, Somerset, England. He granted the next town to the east as Somerset three weeks later. Glastonbury, England was in Wentworth’s time (and still is) noted for several legends. Joseph of Arimathea is said to have brought Christianity to England, choosing Glastonbury as the place he would build a church. He drove his his staff into the ground, and it grew into a tree which supposedly blossoms every Christmas Eve. Another legend says that Joseph brought the Holy Grail to Glastonbury, where it remains hidden today. A third says Glastonbury was Arthur’s Camelot, and that he and Guinevere are buried there. Regardless of is legendary namesake, Vermont’s Glastenbury seems to have been ill-omened from the start. 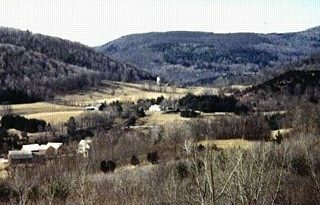 The few settlers who tried found little land to farm in the mountainous terrain. The first US Census in 1791 counted just 34 people in six familes. Children died of whooping cough and diptheria, mothers died in childbirth, and the population stayed about the same for many years. The town was finally incorporated in 1834 and sent its first representative to the Legislature, even though there were still fewer than fifty people in the town. In a period of prosperity after the Civil War, charcoal was produced in Glastenbury, there being an abundance of trees. 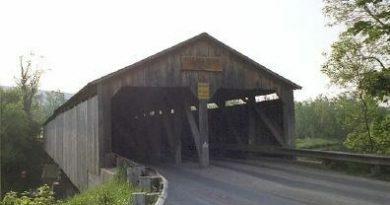 For some years, it was hauled by wagon to Shaftsbury, just north of Bennington. 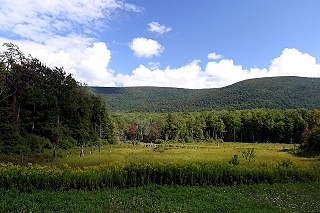 A group of men bought about 6 square miles of Glastenbury and formed the Bennington and Glastenbury Railroad, Mining and Manufacturing company, then laid about 9 miles of phenomenally steep railroad from Bennington into southern Glastenbury; it is said that the road had a rise of 250 feet per mile in some places, the steepest traction railroad ever built in the the US. The company built enormous kilns, which produced some 30,000 bushels of charcoal a month at their peak. A blacksmith shop, sawmill, store and workers’ homes were built, forming the hamlet called Fayville. Eventually, the kilns in the southern part of town and the logging operation in the north exhausted the town’s only resource, and the boom was over by 1889. But the townsfolk hung on, developing a fern-picking industry, reorganizing the railroad, and building a hotel and casino as tourist attractions. In 1898 a flood wiped out the tracks, bringing the tourist business to an end. By the 1930’s the family of Judge Norman Mattison filled all town offices but one, which was held by a summer resident. In 1937 the Legislature disenfranchised the town (see also Averill, Ferdinand, Lewis and Somerset). It is now what we call an unorganized town: its affairs, such as they might be, are handled by a state-appointed trustee. The 1950 census showed only one resident, but he too eventually moved. 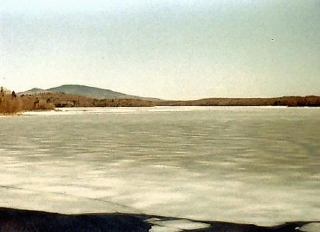 There are only a handful of people who call the town home for a few weeks each summer; aside from The Long Trail traversing the town between Woodford and Sunderland, the only access is one dirt road entering from Shaftsbury, to total no more than two miles of road in the entire town. US 7 gently snakes in and out acouple of times in the northwest corner, with signs telling you that you are in Glastenbury. Rather than having its own government (Select Board, Town Clerk, etc.) the town’s affairs are administered by a state-appointed supervisor.